The Solemnity of the Immaculate Conception -- live from Rome! Tomorrow, December 8th, is the Solemnity of the Immaculate Conception. It marks the day in 1854 that Pope Pius IX declared the Catholic Church believes Mary was concieved free from Original Sin. In many countries it is a holy day of obligation and in many parts of the world it is also a public holiday. Italy is one of those countries and when I lived in Rome as a graduate student December 8th was the biggest public holiday aside from Christmas and Easter. Schools were closed, classes were cancelled, stores were closed (that was the biggest shock to my North American system); supermarkets, banks, post offices, mail delivery, department stores, pharmacies....everything was closed. Families gathered together for a feast that started at lunchtime and went all afternoon. In the University Residence where I lived, our Sicilian cook routinely outdid himself on this day, making a full four course meal, complete with coffee and fruit "crostata" custard cake. To digest it all we would take a leisurely stroll down to the Spanish Steps for the annual crowning of Mary by the Pope. Traditionally in Rome the Holy Father goes to the Spanish Steps where, just around the corner from the famous landmark, stands a column erected in 1856 to mark the declaration of dogma of the Immaculate Conception. Romans flood the small piazza, take over the steps, perch on Bernini's fountain "La Barcaccia" (the sinking boat fountain at the foot of the steps) and crowd the sides of Via dei Condotti not to see the Gucci, Prada, Fendi, Armani wares that are sold on that famous street but to catch a glimpse of the Holy Father. It is a short but meaningful visit. The Holy Father arrives at the foot of the column where a red velvet kneeler is waiting for him. He leads a series of prayers to Mary after which a choir sings and one lucky member of the Rome Fire Department gets on the high-rise ladder to place a wreath of flowers on the outstretched arm of the statue of Mary that sits atop the column. 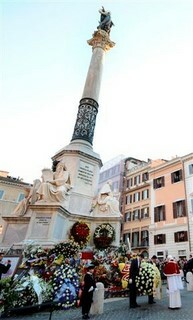 The Holy Father then blesses a large basket of roses that gets placed at the foot of the same column. The Mayor of Rome and the heads of other civic departments follow suit. Salt + Light Television is pleased to be bringing you live coverage of this beautiful event with myself and Matthew Harrison providing live commentary and translation. The event begins at 10:00am ET with an encore presentation at 3pm ET. Remember you can also watch us live on the internet. Just go to our website's main page and click on the VIEW LIVE at the top left hand of the page.